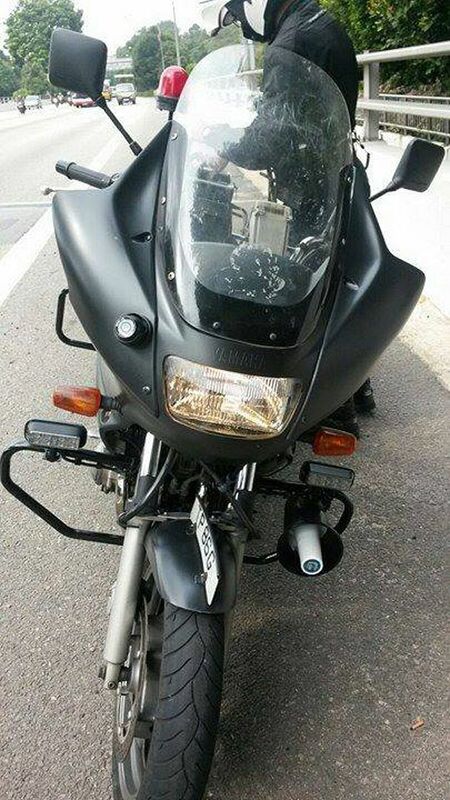 The familiar white Traffic Police (TP) motorcycle in your rearview mirror could now be black. The force recently introduced black motorcycles to its fleet, as part of its "enhanced enforcement operations against errant motorists", a police spokesman said. Due to operational concerns, the police were unable to provide more details regarding the new motorbikes. Meanwhile, photos of the TP's new motorcycles - described by netizens as stealthy with their matt black finish - were making the rounds online last week. A photograph of one of the machines was featured on Roads.sg, an online road safety community, and has been shared over 1,600 times with more than 100 comments from Facebook users. It is believed that the black motorcycles will be used for specific operations, including catching motorists who use their mobile devices while driving. A total of 3,011 motorists - or at least eight a day - were caught last year for this, Traffic Police figures show. Varying the colours of enforcement vehicles, in an apparent bid to blend in with regular traffic, has been employed by other traffic authorities around the world. A 2005 report by The Daily Nebraskan said the Nebraska State Patrol in the United States used to have only white patrol cars, but later added grey, silver, gold, light blue, dark blue and dark green ones. Psychologist Daniel Koh said that motorists in Singapore may have been "conditioned" to associate a white motorcycle with an enforcement vehicle, and will behave themselves whenever they see one. "Now there's an element of surprise as the errant motorists may not pay attention to these black motorcycles. It will take time for people to get used to them," he said. Mr Augustine Lim, 38, a communications executive, said: "This seems to run contrary to the deterrence approach which I thought the police have been going for, since the newer speed cameras are brightly coloured."